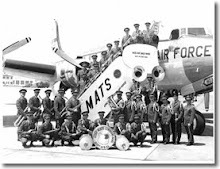 Air Force Musicians Association, Inc.
"Musical Memories, Air Force Style!" Our next gathering will take place August 1-4, 2010 at the Flamingo Hotel in Las Vegas, Nevada. The 2010 AFMA Conference and Reunion Committee is finalizing the registration materials and hopes to have them available soon. It will be important to get an accurate count of attendees, so please check back on our website for those details. Paul Anderson leads our committee this year and has contracted with the Flamingo Hotel, located on the famous Las Vegas Strip as our headquarters hotel. Room rates will be from $50.00 for a standard room to $80.00 for an elegant "GO" room. Vegas room tax is 12%. The conference will open with the traditional "Welcome gathering" on Sunday evening, August 1st, and end with the "Farewell Banquet" on Wednesday evening, August 4th. Special event plans are still being finalized including some side trips and the possibility of an appearance by the Travis Air Force "Band of the Golden West." Other events will be announced as soon as they are finalized. Be sure to subscribe to follow your Air Foce Musicians Blog, or check back on the AFMusic web site about this and other member events!